A 500-year-old legend. An ancient curse. A stunning medical mystery. And a pioneering journey into the unknown heart of the world's densest jungle. Since the days of conquistador Hernán Cortés, rumors have circulated about a lost city of immense wealth hidden somewhere in the Honduran interior, called the White City or the Lost City of the Monkey God. Indigenous tribes speak of ancestors who fled there to escape the Spanish invaders, and they warn that anyone who enters this sacred city will fall ill and die. 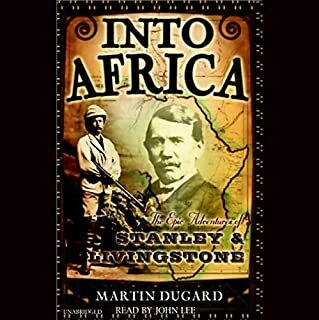 In 1940, swashbuckling journalist Theodore Morde returned from the rainforest with hundreds of artifacts and an electrifying story of having found the Lost City of the Monkey God - but then committed suicide without revealing its location. Three quarters of a century later, best-selling author Doug Preston joined a team of scientists on a groundbreaking new quest. In 2012 he climbed aboard a rickety, single-engine plane carrying the machine that would change everything: lidar, a highly advanced, classified technology that could map the terrain under the densest rainforest canopy. In an unexplored valley ringed by steep mountains, that flight revealed the unmistakable image of a sprawling metropolis, tantalizing evidence of not just an undiscovered city but an enigmatic, lost civilization. Venturing into this raw, treacherous, but breathtakingly beautiful wilderness to confirm the discovery, Preston and the team battled torrential rains, quickmud, disease-carrying insects, jaguars, and deadly snakes. But it wasn't until they returned that tragedy struck: Preston and others found they had contracted in the ruins a horrifying, sometimes lethal - and incurable - disease. Suspenseful and shocking, filled with colorful history, hair-raising adventure, and dramatic twists of fortune, The Lost City of the Monkey God is the absolutely true, eyewitness account of one of the great discoveries of the 21st century. 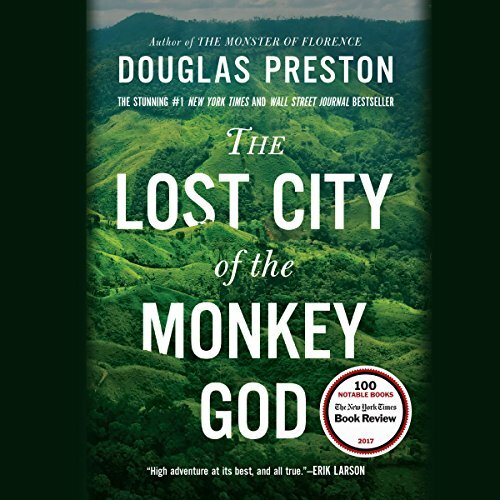 Douglas Preston's tale of the discovery of the remains of a lost civilization in the Mosquitia region of Honduras, and his first person account of his experiences accompanying the investigative team, make for riveting listening. The region is dangerous and notoriously difficult to access and the team encounter real dangers in their quest, just as they make real discoveries. There's mystery, adventure, colorful characters and the book even takes a rather unexpected turn (which I don't wish to spoil). 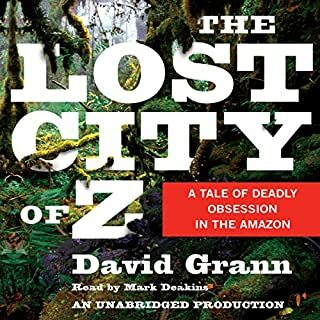 Having read (and listened to) Christopher S. Stewart's book, Jungleland a few years ago, which is also about the search for La Ciudad Blanca (ie: the Lost City of the Monkey God) in Honduras, some of the historical background covered in this book was familiar to me but no less interesting. In fact, in some ways, The Lost City of the Monkey God felt like it picked up where Stewart's book left off. Bill Mumy does a great job on the narration. Highly recommended. 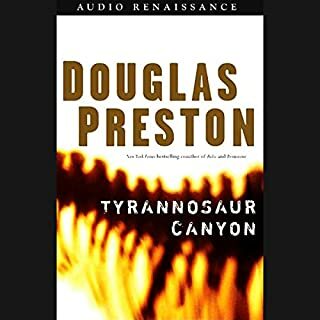 A romantic notion...these lost cities, discoveries of ancient civilizations, and all the possibilities that hang on each little artifact that trickles out of obscurity...but Preston's tag-along accounting winds up a little anticlimactic. That's not to say that there isn't a lot of information here, but it winds around any actual discovery or headway to finding the White City aka the Lost City of the Monkey God, about as circuitous as the featured pictured of the Patuca River (see PDF, page 4--I'm talking lots of zigging and zagging, serpentine). 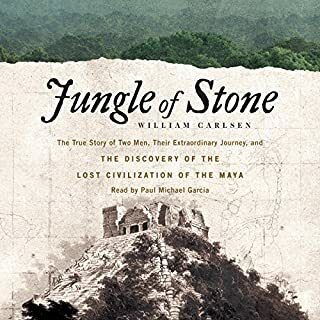 Preston takes 10 1/2 hours to give us all kinds of entomology and herpetology tidbits, historical offshoots of ancient civilizations, and details of setting up camp in the Honduran jungles, but nothing close to the kind of discovery deserving of popping open the champagne (maybe a beer). The technology of the *lidar* is interesting, and the photos (again, PDF) are a compelling argument for the existence of some kind of civilization that once existed in the T1 Valley. Ultimately, this is less an expedition than an accounting of all the hoops that must be jumped through, the governmental (and Native people's rights), the red tape, and snafus that accompany this kind of an undertaking; it's a tiny look at the dedication of patient explorers and dreamers. I've read quite a few books of this kind, as probably anyone checking this out has also, and I was hoping for more. This is a middle dweller -- not as interesting as Lost City of Z, or River of Doubt, better than Jungleland (a book about a similar trip to find the Lost City of the Monkey God, written by Christopher Stewart). 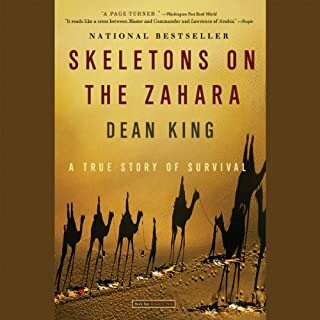 This one doesn't deliver on the promised *hair-raising adventure* as claimed in the summary, and though you may by the ending find yourself frustrated, I doubt you'll find this anywhere near *suspenseful* or especially *shocking*. For every foot of expedition, there are miles of paraphernalia. Whole chapters are devoted to a parasite (and the treatment) that plagued a few of the team members; this is followed by a strange cautionary exhortation to society by the author. I think I would have preferred the slide presentation, but other readers have given this high ratings so I suggest reading those glowing reviews. Just plain LOST would have better title. What would have made The Lost City of the Monkey God better? Having a better copy editor would have worked miracles for the story. The story short-changes the search for the Lost City of the Monkey God and nauseated me with the extensive description of the medical problems encountered by the team. If I want to read medical texts about rotting, necrotizing flesh, I know where to find them and it would not be in a book promoted as the discovery of a lost city in Hondurous. Perhaps going back to 4th grade and studying the concept of the story arc would help. What was most disappointing about Douglas Preston’s story? It is so poorly written and filled with non-essential sidebars that you fully understand how a group of nonscientists had zero business attempting to discover the city of the Monkey God. Perhaps had they been a bit more risk-takers and that adventure recorded, the story would have been more palatable. Selecting a reader perhaps who was not working so hard to be so dramatic through the entire work would have eased the listener's anguish of waiting for the climax of which there were none.The reader tried to use a dramatic voice throughout the entire book which is annoying and tiresome. I tried to slow down the reader to even out the inappropriate highs and lows but that didn't work. The reader was so annoying reading the medical problems I finally gave up on the book and I deleted it. Grand disappointment and annoyance. This is one of the very books I would like a refund for being deceived by the promotional items. And that's my reaction. As noted above, this was one of the few books I felt I should ask for a refund on because it was so poorly done in so many ways. Such a compelling book to listen to. An amazing book. A mixture of Indiana Jones meets epidemiology. Such an amazing history lesson. Reader's lack of knowledge of Spanish pronunciation very annoying he also makes other mistakes like saying "cheek by fowl" instead of "cheek by jowl"
this book gives a variety of different world views to think about. some rather scary. I enjoyed both the book and the reader. think I might have to pick up a hard copy. Glad I listened to the whole book. The narrator, on the other hand, needs some work on basic pronunciation of many words (and I don't mean the scientific ones). I could not finish listening to this. It couldn't hold my attention. I didn't finish it, preferring move on to something else. Hideous tropical parasites - NOT lost cities! If it had really been about Ciudad Blanca, or whatever. 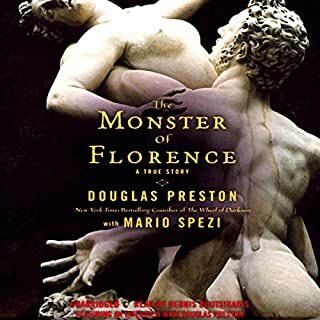 Would you ever listen to anything by Douglas Preston again? What didn’t you like about Bill Mumy’s performance? Yes, if you like detailed descriptions of parasitic diseases. Yech! Others have described what's wrong with this book. Read the negative reviews. Good luck!